A wearable band that logs cravings, offers personalized support that is customized to your smoking habits and craving patterns. MyQuit band is a behavioral support program that begins with understanding your own cravings and smoking habits, and helps build the right foundation for a truly personalized path. 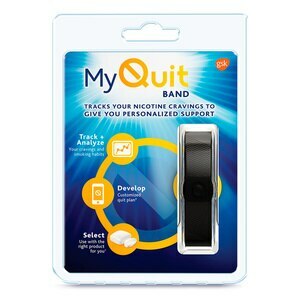 MyQuit band is the only one in the market that will support you in your quit attempt. Backed by 20+ years of research to understand smokers habits. MyQuit band is part of a larger support program: the tracker logs any cravings or cigarettes, the MyQuit band app helps you with tips/advice, and there is a portfolio of products to help as well. It is not necessary to have the app installed before first activation. All logs previously collected will be transferred to the app once the connection becomes available. - Follow these steps to log your data and this will immediately synchronize with your MyQuit app. - The more intense the craving, the longer the side buttons should be held and more LEDs will light up. Visit www.quit.com for more information related to FCC Warning. This product is not a medical device and is not intended to diagnose, treat, cure, or prevent any disease. - In some users, prolonged skin contact can lead to skin irritation. If you notice redness, swelling or other skin irritation discontinue the use of the band. lf symptoms persist longer than 2-3 days after removing the band, consult your doctor. - This band is not a toy. This product contains small components that may present a choking hazard. Do not place band in mouth. Do not allow children or pets to play with your product. Keep out of reach of children.